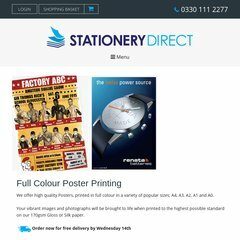 A0poster is ranked 4,782,046 in the United Kingdom. Topics: Custom Quote, Business Cards, Letterheads, Compliment Slips, Stationery Save Packs, and Envelopes. It is hosted by Atls-lb (England, Leeds,) using Apache/2 web server. ns2.123-reg.co.uk, and ns.123-reg.co.uk are its DNS Nameservers. The site is programmed for PHP/5.2.9.